I ventured to Harney County for the first time, 20 or more years ago, after I had read a memoir by the writer William Kittredge. The book is called “Owning It All” and for me it was a deeply affecting work. Throughout it Kittredge celebrates the hardscrabble, wide-screen landscape of this Southeastern Oregon desert county where he was raised, while at the same time he atones for and criticizes the devastation several generations of his ranching family unleashed upon that land. It is a tragic and cautionary tale that reminds us that the land we think we own can turn back on us, and that we are all more vulnerable and connected to the forces of nature than we care to admit. It is a book about failed dreams in a place of raw beauty. When I finished reading it I knew I had to see with my own eyes the country Kittredge had written about so unsparingly. It became a compulsion of sorts and since then I have traveled there many times. 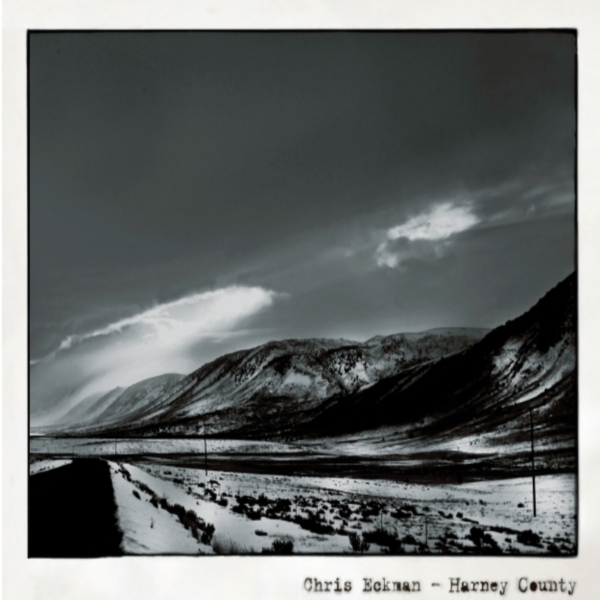 After returning from that first trip (a long story in itself), I quickly wrote a song called “Death At Low Water” which ended up on the Chris and Carla album “Life Full Of Holes”. The song seemed gifted to me by the landscape and the dusty towns I had just visited and the lyrics call out landmarks in and around Harney County, namely Steens Mountain and Denio, the border town in Nevada, just to the south. It is a somewhat brutal song but it is also a song about faith and family and holding tight to the things that hold us together. Even back then, I thought I should someday write and sing a collection of Harney County songs. With this new album I finally got around to doing just that. Most of the songs on this album came alive when I was fashioning the sounds and words for the last Walkabouts record “Travels in the Dustland”. They are in some ways of a piece with the “Dustland” songs, but even then I knew they needed to be in a different pile. They are less about musical gestures and more about what is being sung. And while the songs for “Travels in the Dustland” were also desert songs, their landscapes were abstract and mythical. Here the events and characters are imagined but the places are real and the roads are ones I have driven myself. I can see in my minds eye where these roads rise and where they bend. I can see Steens Mountain in the distance brooding high above the Alvord desert and the scattered trailer homes and white-board ranches. These specific landscape memories are the foundations of this music and the reason why I’ve called the album “Harney County”. The county’s vast sagebrush drylands, windy mountains and marshy flats (where thousands of flocking birds can sometimes be seen) are places where humans are small and often ineffectual. The snow is heavy in the winter and the sun is harsh for the rest of the year. These unforgiving elements cast a long shadow upon the characters in these songs. They fight to do their best in a region where beauty and hardship seem to come in equal measure. I wanted a sense of both rawness and restraint in the recordings for this album. I felt those qualities were already imbedded in the songs and that the musical performances should also reflect them. The upright bass player Žiga Golob and I played the songs live and unadorned for two days in a sprawling, reverberant studio on the outskirts of Prague. The room can hold an 80-piece orchestra and there we were, just the two of us face-to-face in the middle of the floor, dwarfed and a bit awed by our surroundings. Given the subject matter of the songs, this somehow felt correct. Žiga brought the essential pulse and dialogue to these performances and I couldn’t have done this record without him.